Defeating Dieback on the Monaro may be an ambitious feat but the establishment of 10 strategic 2ha plots may soon be underway with thanks to the Upper Snowy Landcare Committee and Berridale Rocky Plain Landcare group who have been in grant writing mode now for a number of years to attract funding to address this devastating issue. ‘Defeating Dieback on the Monaro’ is the title of one of the latest project applications submitted to the SE Local Land Services (SELLS) to cover the cost of establishing the revegetation plots and to produce a step by step best practice planting guide for landholders who wish to successfully revegetate their own country. We have also submitted a second application to SELLS to fund the management of this project and are awaiting news from the NSW Environmental Research Grant which if successful will look at the cause of this mass loss of mostly Eucalyptus Viminalis trees and whether this phenomena is on the wane. The mass loss of vegetation in an approximate 5000 sq km area is critical to both the agricultural and environmental future of the region. It is widely understood that fracturing or loss of habitat connectivity opens up new areas to weeds, loss of shelter belt benefits and contributes to further erosion. 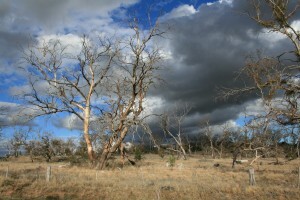 Not only that, un-connected vegetation leads to the loss of critical food supply and breeding habitat for species such as koalas, small bush birds, reptiles, terrestrial and arboreal mammals. 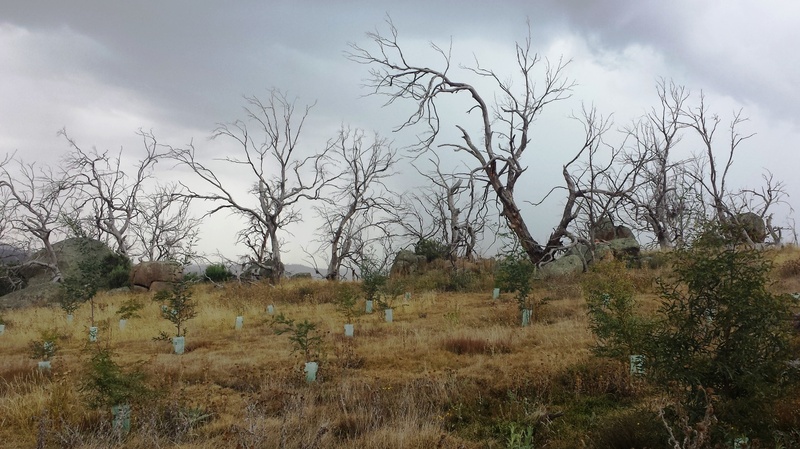 To maximise our effort in dealing with this dilemma we intend to establish the restoration plots in the dieback affected area along the visual road corridors ie Monaro Highway and other roads between, Adaminaby, Berridale, Cooma, Dalgety and Nimmitabel. This way they will be visible to the public and will promote what a good revegetation plot will look like – giving landholders in the dieback affected area the confidence and encouragement to establish their own revegetation plots. Therefore, to get the best on-ground outcome, we intend to work with local tree expertise who have long term experience and proven results in planting in our harsh climate. We will be using their recommended methodology for establishing quality tree/shrub plots which include deep ripping, spraying (x 2 prior to planting to supress competition), sow young fresh tubestock (50% tree/50% shrub) deep in the rip line with a fertiliser tablet and protect the plant with a quality tree guard. We will be putting these planting steps together into a comprehensive tree planting guide for local landholders which will be widely available. We will also be hosting field days on the plots and we have high hopes that we will engender a groundswell of landscape restoration to compensate for the dieback. So fingers crossed for some successful grants.